I remember being briefed about the Paerata Special Housing Area by then Deputy Mayor (now Councillor) Penny Hulse when the Councillors were in the old Civic administration building before they moved over to their new site (that I call the Tower). The Paerata Special Housing Area would become the largest SHA of all the SHA’s with a total yield of about 4,500 houses, a new Town Centre and a new rail station. UPDATE: I am been informed that this is a vision plan for Paerata Rise and is subject to changes before final sign off/approval by Council beyond Stage 1. In short there is a lot of water to go under the bridge before Stage Two and beyond are set and built. The plan can even be upended and start over again from scratch. Fast forward to 2017 and look how far we have come with Paerata Village to be Auckland’s newest village. Ground has been broken and the foundations for a small village that will provide thousands of new homes less than an hour south of Auckland City are being laid. The first of these homes will be ready to welcome new residents, into the small town near Pukekohe, as early as the middle of next year. 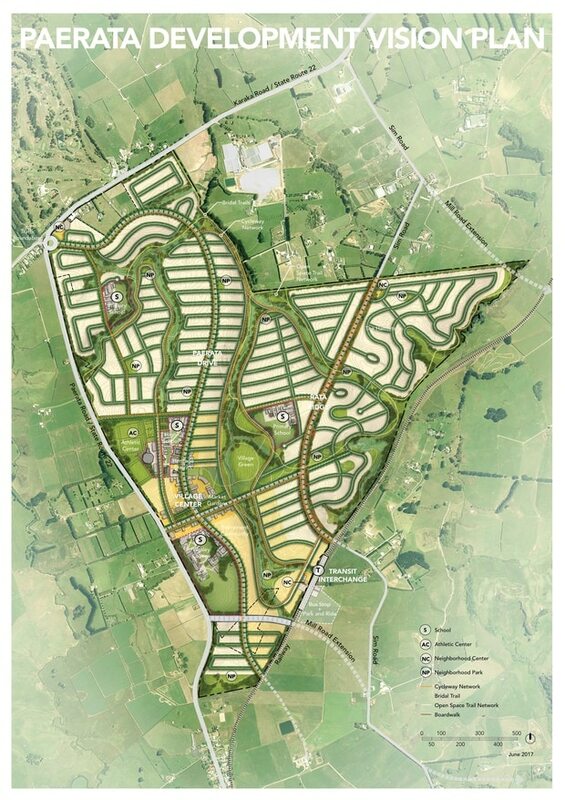 Maps and artist’s impressions of the village soon to rise out of the South Auckland landscape have been released to the Herald. They show a village centre, complete with its own heritage district, market gardens, schools, retirement village, transit interchange and other amenities on the site of the former dairy farm. On the remainder of the 276.9 ha block will be built thousands of new homes, intertwined with green spaces, cycle paths and walkways. There would be between 4000 and 5000 new houses in a mixture of terraced, apartment and stand-alone configurations. The design of the village was created by San Francisco-based Surfacedesign a company co-founded by Kiwi urban designer and sustainable landscape architect James Lord – the same company responsible for Auckland Airport’s landscaping. Plans for the development of the land, upon which Wesley College had been based since 1924, were announced in late 2015. The first stage of digging up the land was done, waste and water pipes were being laid and by mid-December the builders would have road access to the site by mid-December, with the first homes ready by mid-2018. Johnson said the village’s name, Paerata Rise, paid homage to the area’s history and to its present community. “As well as acknowledging the existing Paerata community, the name is a nod to the meaning of Paerata in te reo, that is, ‘horizon of the rata’. For reference the new electric trains will be servicing Paerata Station (as part of the Pukekohe to Britomart run) anytime after 2019 while full electrification of the Papakura-Pukekohe Line is due for completion 2025. So at least the transit options will be available pretty much right off the bat. Population potential working on the ratio of three people to a dwelling means Paerata Rise could potentially house 15,000 new residents! Exciting times ahead in the City building department.